Hey there blockers! It’s yet again time for another show! This week, something a little bit different. Instead of covering a specific game, we’re gonna get techie and discuss some ways to play all these great old games I’ve been covering on our modern, ultra-fast, multi-core gaming rigs. But first, some news. I follow up once again on both the Tex Murphy and SpaceVenture kickstarters. Check em out and give your support if you think they’re worthwhile! Also, the E3 show has been going on this week where trailers were released for the next SimCity and the new X-COM: Enemy Unknown game in development. I wanted to let everyone know about The Blackwell Bundle, a cool adventure series done in the style of classic VGA adventure games that I’ve been playing since the last show. Check it out! The main topic for the week is how to get old games running well on modern systems. We cover some background, what difficulties we encounter trying to get this all running. Then I start the discussion of emulation, define what it is and where it’s used. I then get into details of two different applications that are used to run DOS games in emulation, DOSBox and ScummVM. Finally we listen to an audio comment from Dan where he talks about his experience with retro gaming and DOS emulation on iOS. That’s that! Enjoy the show and see you all next time when we talk about Wolfenstein 3D! Ok, so when you said you’d do a show on emulation, I thought “oh goodness, this is going to be so tedious, what could there possibly be to say on emulation that goes on for an hour?” Well… I was wrong! 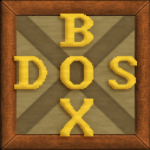 I know a bit about DOSBox and ScummVM, having used them to run my older games, but you definitely made it interesting, the difference between the two applications, how ScummVM came to be, all the intricacies about how they work. Great stuff! Since most of my favorite games are from the era prior to ‘native windows’ integration, I’ve become more familiar with both of these emulators. Because I’m also playing on a Linux machine (Mint, favored by GOG) I’ve also had to get in and tweak the settings for the games to run properly. Luckily, it doesn’t take much after the initial config – and some of these classics actually run better on my setup than they did back in the day.